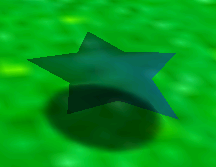 Star Markers are types of stars found in Super Mario 64 and its remake, Super Mario 64 DS. These star-shaped shadows mark the spot where a Power Star appears once Mario collects all eight Red Coins in a level. The Power Star appears above the Star Marker once all eight Red Coins have been collected. Also, it should be noted that there is no Star Marker in Jolly Roger Bay. This page was last edited on March 29, 2019, at 01:53.